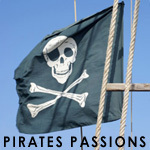 By voting on the books listed, you can help to determine whether a book is related to the theme of Pirates Passions, or whether it is a non-related, but popular, book among the members of the site. If you believe a book in the list below is 'on theme' with Pirates Passions, vote that it is relevant. (If you don't know, just skip it.) Over time, we hope to have a library of books that should be of interest to Pirates Passions members. They became heroes in the eyes of the people and, in this, their untold story, their glorious Republic lives again. Considered the major source of information about piracy in the early 18th century, this fascinating history by the author of Robinson Crusoe profiles the deeds of Edward (Blackbeard) Teach, Captain Kidd, Anne Bonny, others. A revisionist history of the golden age of piracy draws on original archive records to provide a realistic study of pirates and their lives that refutes many of the myths about the era.